The Droid Bionic displays the current battery status at the top of the screen, in the status area, next to the time. The icons used to display battery status are shown in this figure. Battery Status: This setting explains what’s going on with the battery. 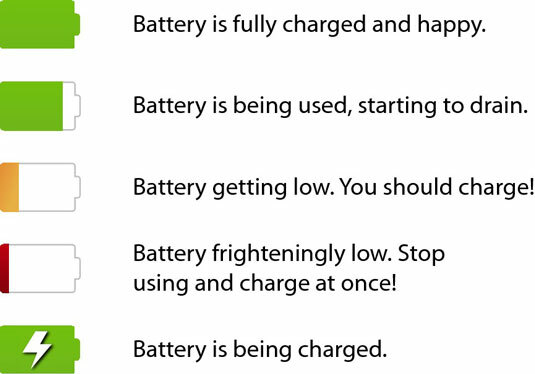 It might say Full when the battery is full, Discharging when the battery is in use, or Charging when the battery is being charged. Other text may be displayed as well, depending on how desperate the phone is for power. Battery Level: This setting reveals a percentage value describing how much of the battery is charged. A value of 100 percent indicates a fully charged battery. In addition to the status icons, the Droid Bionic notification light turns a scary shade of red when battery juice is dreadfully low. The best way to deal with a low battery is to connect the phone to a power source: Either plug the phone into a wall socket or connect the phone to a computer by using a USB cable. The phone charges itself immediately; plus, you can use the phone while it’s charging. You don’t have to fully charge the phone to use it. If you have only 20 minutes to charge and the power level returns to only 70 percent, that’s great. Well, it’s not great, but it’s far better than a 20 percent battery level.